As a creature of habit (see my Life Uniform post) I wear the same clothes frequently. I am big on favorite items that get worn over and over and over. I also get pretty sad when my favorite things wear out. Recently, my favorite pair of Levi's reached such a state of disrepair that it was either do something drastic mending-wise, or add them to the scrap denim heap. It doesn't help me at all that riding a bicycle as much as I do is hard on pants. Riding puts a lot of stress on the inseam and seat of any pair of pants, and my Levi's, being classic fit non-stretch denim, were more inclined to shred, and had finally given up the ghost. So, last weekend while my kids were at theater class, I ripped out the inseam of my jeans. This was surprisingly time consuming with serging plus seam stitches plus top stitching to take out. I opened a hole that went several inches past the holes on each side. My plan: put in a gusset using stretch denim. A gusset is a good solution to the problem of an over stressed inseam area as a triangular piece disperses the stress in the area better than just a straight seam. I think of it as the same amount of stress split between two seams instead of one. To draft my gusset piece, I lay my opened inseam on the fold at center back and played with my various curves before settling on my armhole curve and cutting out a section of the pants that was small enough that it wouldn't really show as I was standing up, but large enough to cut into non-threadbare fabric. It was a fine line to find the sweet spot and just took some fussing around with it. One key thing to pay attention to is keeping the cut line perpendicular to the center back seam so the gusset can be sewn in one nice line. 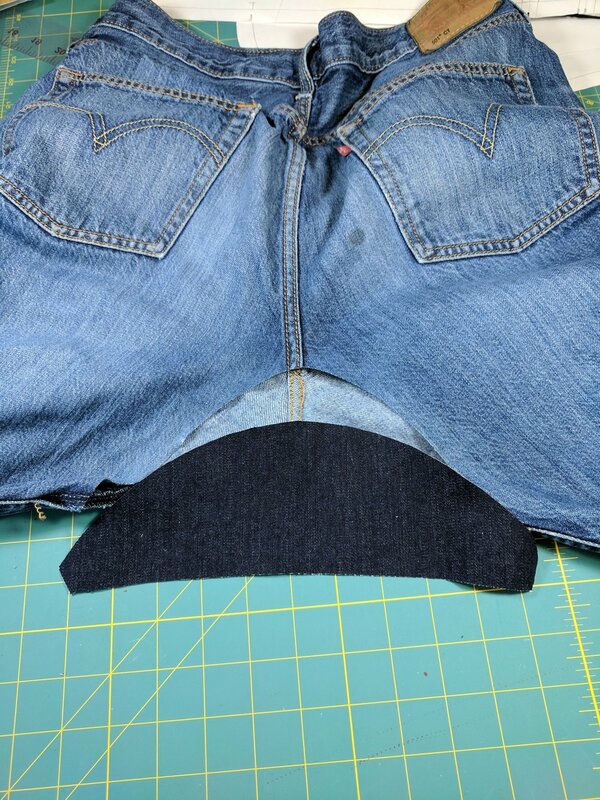 Then I traced the cut piece, added seam allowances on the curved edge (there was already seam allowance on the straighter edge) and cut a piece of fresh denim. It's a little awkward to get the gusset stitched in place in an already assembled pair of jeans, but I managed it. I opened the inseam a little further to allow more room to maneuver under the machine and it was no problem. I started on the curved edge and once I had it stitched all around, I serged the inside edges and top stitched to match what was already there. I only had dark indigo denim, but a person would have to get way too familiar with me to see it and the indigo will fade over time. 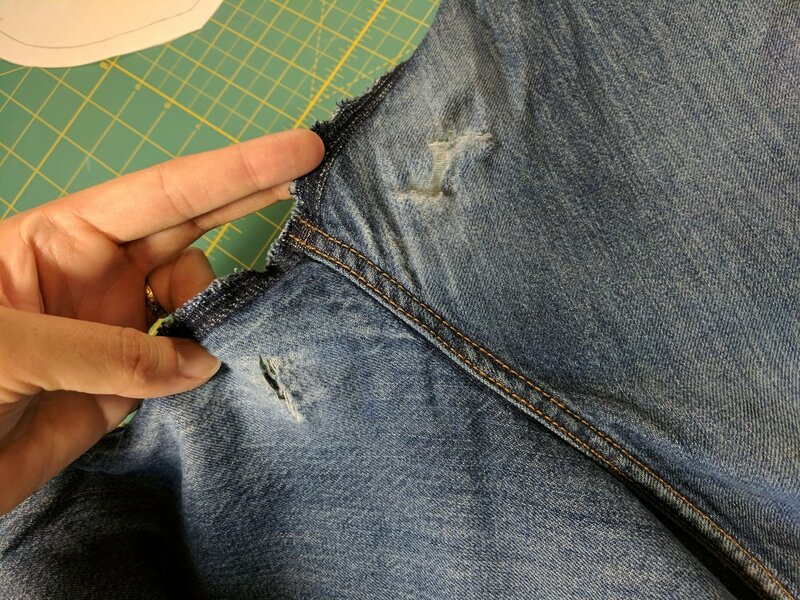 My favorite jeans have been rescued and I will be drafting a gusset piece into any future jeans patterns I make as it will be easy to rip out and replace, can easily be made double thickness, and is less likely to tear to begin with. See other mending posts here.